CLARIN is a European Research Infrastructure for the Humanities and Social Sciences, focusing on language resources (data and tools). It is being implemented and constantly improved at leading institutions in a large and growing number of European countries, aiming at improving Europe’s multilinguality competence. 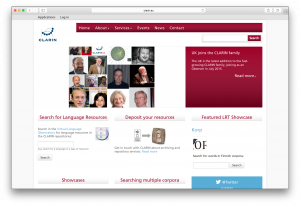 CLARIN provides several services, such as access to language data and tools to analyze data, and offers to deposit research data, as well as direct access to knowledge about relevant topics in relation to (research on and with) language resources. CLARIN is governed by CLARIN ERIC, a consortium of 16 countries, represented by their ministries.